Enemies by birth. Allies by choice. Together, can they defy their fates? Cyra Noavek and Akos Kereseth have grown up in enemy countries locked in a long-standing fight for dominance over their shared planet. When Akos and his brother are kidnapped by the ruling Noavek family, Akos is forced to serve Cyra, the sister of a dictator who governs with violence and fear. Cyra is known for her deadly power of transferring extraordinary pain unto others with simple touch, and her tyrant brother uses her as a weapon against those who challenge him. But as Akos fights for his own survival, he recognizes that Cyra is also fighting for hers, and that her true gift—resilience—might be what saves them both. THE CONCLUSION TO THE CARVE THE MARK DUOLOGY. ON SALE 4.10.18! In a stunning twist, Cyra and Akos will discover how fate defines their lives in ways most unexpected. 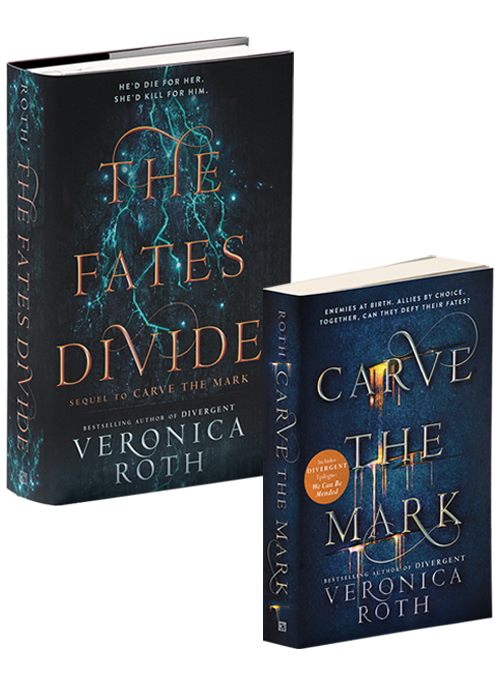 The paperback edition of CARVE THE MARK includes the DIVERGENT Epilogue: WE CAN BE MENDED!